Kyoto, rainy season. The humid air diffuses a fascinating botanical scent through the silver pavilion. Porcelain-white gardenia flowers at the foot of the wooden stilts cast their fragrant spell. A heady blossom worn as a boutonniere. Founded in 1981 under the impetus of creator Annick Goutal, the namesake brand is still driven by the same passion today: to whisper stories in the hollow of the neck. The timeless symbol of this desire, Eau d'Hadrien  the very first fragrance by the House  continues to capture the attention of dreamers in search of olfactory tales. In 2018, thirty-seven years after its founding, the French fragrance house is writing an exciting new chapter in its story. Respectful of its heritage, this new inspiration is deeply rooted in the legendary poetry of the brand while steadfastly looking to the future. 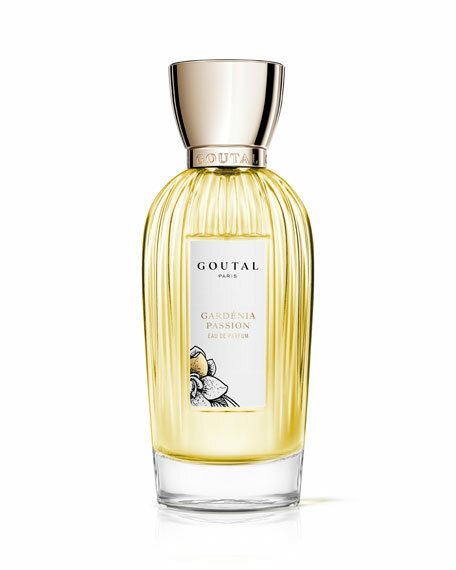 In 2018, Annick Goutal becomes Goutal Paris, Conteur de Parfums. New cases. A revamped visual identity. Even greater delicateness. An opportunity for the brand to release a new interpretation of Eau d'Hadrien by Annick Goutal's daughter, Camille Goutal. An invitation to continue writing the story from back where it all began. A new opus - Bois d'Hadrien.